Bruce Fordyce, cruising at 5:40 pace. Though he slowed later in the Chicago race, his time of 4:50:50 for 50 miles makes him the owner of the fastest two times ever recorded for that distance. Alan Weeks on the Wasatch Front 100 Mile trail. As you can see, our stock of cover photos is pretty well depleted. All we can offer you is this shot of Mike Witwer's foot after the Santa Rosa (Calif.) 24 Hour Run. Yiannis Kouros of Greece en route to an all-time world record six - day run of 635 miles in New York City. Kouros broke the 1888 record of George Littlewood (623 miles) which was the oldest record in running. That distinction now reverts to the 400 meter record, set in 1968 by Lee Evans. Bernd Heinrich races the clock to Lake Waramaug's 50-mile finish line, winning that race with a sub - 5:30 time. He continued on to win the 100 km as well, but that was just a warmup for his 100 mile effort in late May, when he set a spectacular U.S. 100 mile record. Al Zeller (right) and Bob Otten were neck and neck after 25 miles of the Wolf pack 50 Mile. The veteran Zeller prevailed with a PR 5:47; Otten held on to finish second in 5:52. Brian Schaeffer of Boise Idaho nears the top of the rugged trail section at Arizona's Four Peaks Fifty. 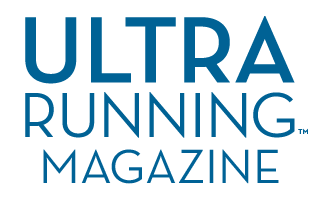 The world of ultrarunning is much more than competing in 24 hour track runs, 50 mile road races, or multi-day track or road races. There are many trails to explore, such as the Pacific Crest Trail near San Diego shown here, volcanoes to run around, and mountains to ascend. See page 8 for a reveiw of a new guide to adventure running. Al Prawda showed incredible steadiness at the CIC 48 Hour in Haverford, Pa., finishing the race with no sleep. He accumulated over 211 miles, which places him at #2 on the modern U.S. list. Katherine Brieger, Jasper Kirkby and Doug Latimer battle the wind and rain at the Challenge Cup in San Francisco - one of many ultras late in 1983 to be hit by bad weather.